When your company is in last place, something awesome sometimes happens: You try harder. You innovate more. You’re already in last place — what do you have to lose? And when your CEO treats the status quo the same way a bull treats teacups in a china shop, the party can get very wild indeed. 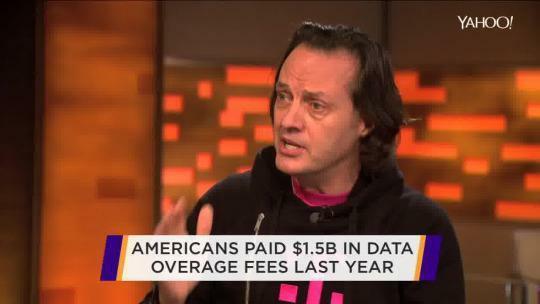 Led by John Legere, T-Mobile has spent the last three years systematically shredding every traditional policy that we the people despise — like hidden charges, outrageous international roaming fees, and data that expires if you don’t use it. It all started with T-Mo’s eyebrow-popping announcement, in March 2013, that it would no longer require a two-year contract. You’re not locked in. You can leave or rejoin whenever you like, without penalties. The other wireless carriers — Verizon, AT&T, and Sprint — hated that. Locking you in was an important moneymaker. Without that guarantee, how were they supposed to retain customers? Why, they’d be forced to compete on the quality of their service! But last week, Verizon shocked the masses by announcing that it, too, would eliminate two-year contracts. You pay for your wireless service and your mobile phone separately and transparently. Well, guess what? It’s all paying off — both for you and for T-Mobile. Last month, after nine rounds of these “Uncarrier” initiatives, T-Mobile was no longer in last place. It has stepped up into third place, overtaking Sprint in number of customers. All of this got me thinking: Yes, T-Mobile has forced the American wireless industry to abandon the two-year-contract scam. But that’s just one in a long string of other “Uncarrier” announcements. 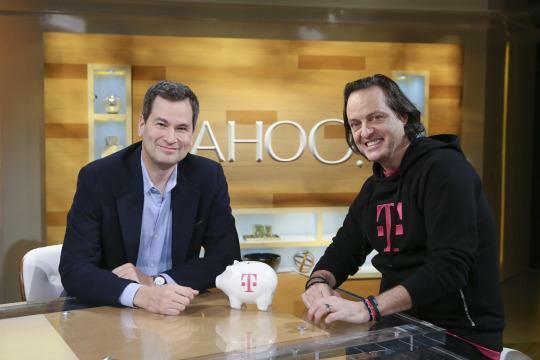 Which of them have similarly forced the hands of T-Mo’s big rivals, so they wound up benefiting everyone? And which initiatives have the other carriers ignored? CEO Legere maintains publicly that he loves it when his rivals play copycat, because he just hates all those user-hostile policies. I’d imagine that he’s got mixed feelings, though; every time a competitor adopts one of T-Mobile’s goodies, that’s one less thing that makes T-Mobile uniquely attractive. I’ve come up with a blow-by-blow accounting of T-Mobile’s Uncarrier policy shifts, identifying the ones that led to permanent change in the industry. 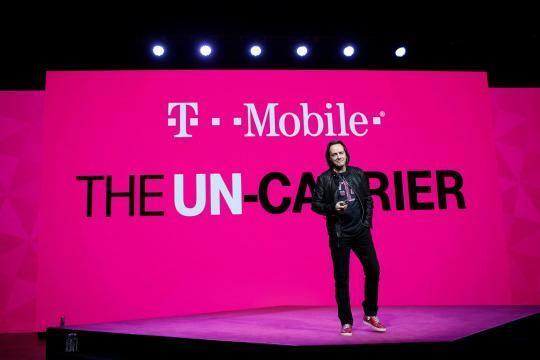 The deal: You can start or stop T-Mobile service whenever you want. The cost of the phone is calculated independently and transparently. Verizon response: Eliminated contracts in August 2015. AT&T response: Offers some no-contract plans, although AT&T’s CEO acknowledges that contracts will eventually go away. Sprint response: Will eliminate contracts by end of 2015. 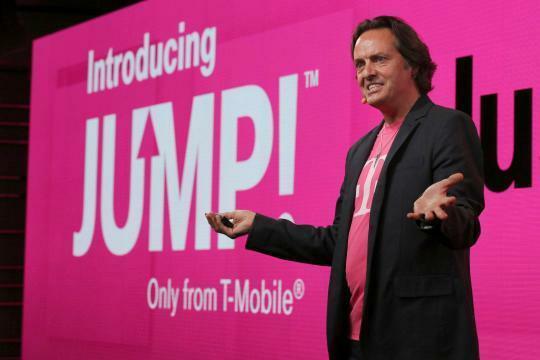 The deal: For $10 a month, T-Mobile’s Jump program lets you switch to a newer phone model any time after you’ve repaid half its full price. In other words, you don’t have to wait two years. Verizon response: Introduced Edge, a program similar to T-Mobile’s. This year, Verizon abandoned that program in favor of a simple installment plan. Pay for your phone in installments, pay off the remainder when you want a new phone. AT&T response: Introduced the Next plans — various “pay for your phone in installments, pay off the remainder when you want a new phone” programs. Sprint response: Sprint’s offers have changed many times, but at the moment you can lease your phone (you never own it). If you pay $10 more a month, you can upgrade your phone after 12 months. Free (low-speed) Internet and texting, and 20-cents-a-minute calling, in 120 countries. Using your phone overseas no longer means coming home to a $3,000 roaming bill. If you buy an iPad or another tablet from T-Mobile, you can use 200 megabytes of cellular service for free, forever. That’s not tons, but it’s fine for quick email checks. When you break your contract with another carrier, T-Mobile pays off whatever you owed on your Verizon, AT&T, or Sprint phone, and any fees for breaking your contract, up to $650. Verizon response: Offers $300 when you switch to Verizon and turn in your old phone. AT&T response: Offers $300 when you switch to AT&T and turn in your old phone. Sprint response: Matches T-Mobile offer (for a “limited time”). If you go over your monthly data limit, your Internet speed slows down, but you don’t pay anything more. There’s no automatic charge of $15 or more per extra gigabyte, as there is for the limited Verizon, AT&T, and Sprint plans. This is different; it’s “try before you buy” rather than a return policy. You don’t give up your existing phone while you’re testing T-Mobile’s service. You can listen to unlimited Internet music without spending any of your monthly Internet data. The list of 33 services includes Apple Music, Pandora, iHeartRadio, Rhapsody, Spotify, Slacker, Rdio, SoundCloud, Groove Music, Live365, Google Music, SiriusXM, and Tidal Music, among others. All T-Mobile smartphones let you call for free whenever you’re in a Wi-Fi hotspot, which is a godsend for indoor locations with poor cellular coverage. T-Mobile will also give you, on request, a free personal hotspot for use indoors, so you get unlimited free calling inside your home (the other carriers charge for this device). Verizon response: Will have Wi-Fi calling by end of 2015. AT&T response: Wi-Fi calling for iPhones starting in September. Sprint response: Wi-Fi calling starting April 2015. If you don’t use your entire monthly data allotment each month, you can “roll it over” into next month’s bucket, for use up to 365 days later. AT&T response: AT&T lets you roll over unused data — but you must use it in the next 30 days (instead of 365 days). Free calls from the U.S. to Canada and Mexico. And when you’re in Canada or Mexico, unlimited free calls and texts, and your data is treated like regular U.S. data (no roaming fees). Verizon response: Lowered the price of its Mexico/Canada package. AT&T response: For $5 more a month, you can add free Mexico/Canada calling (no data included). Sprint response: August 2015: Free calls and texts, and 1GB of high-speed data, in Mexico, Canada, and 12 Latin American countries. Sprint response: Sprint offered phone leasing even before T-Mobile did but still locks you into the phone for at least a year. Obviously, I’m quite taken with T-Mobile’s willingness to shake up the industry. I love little-guy innovation stories. I love watching the entrenched players quake in their boots (or at least puff up in irritation). None of this means that T-Mobile is perfect, though, or even that T-Mobile is the best cellular carrier for you. The biggest issue continues to be coverage. Yes, the company has made huge strides in acquiring “spectrum” (meaning that it’s been rapidly filling in gaps in its coverage), and its coverage is generally good in metropolitan areas. But nobody pretends that T-Mobile’s coverage is as good as, say, Verizon’s, especially in rural areas. As this examination shows, T-Mo’s bigger rivals haven’t always followed in the trails T-Mobile has blazed. But they’ve followed often enough to show how much power an aggressive underdog can lord over the alphas. So yes, bold innovation and entrenched industry rule breaking can pay off for a last-place company. Good lesson for business-school types. For everyone else, the lesson is even more joyous: T-Mobile’s radical redefinition of wireless service winds up benefiting everyone — even people who will never make a single T-Mobile call. David Pogue is the founder of Yahoo Tech. On the Web, he’s davidpogue.com. On Twitter, he’s @pogue. On email, he’s poguester@yahoo.com. He welcomes nontoxic comments in the Comments below.